Makes demonstrations viewable by the entire classroom. Make all your optics experiments easily visible by the entire class with these large demonstration lenses which are easily mounted on a large lens support stand. 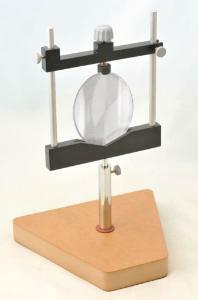 Demonstrate a telescope, microscope or neutralizing lens by mixing all the different lenses. The set includes six lenses and the large lens support stand.